Listed below are the best tourist attractions and the most famous tourist places in Mumbai. South Mumbai has beautiful buildings which are based on British Victorian, Gothic and Indo-Saracenic (mix of Indian and Mughal) styles of architecture. Many of these stunning buildings were built in the late 19th and early 20th century. The most stunning examples of this are the Victoria Terminus (VT) Railway Station and BMC (Mumbai Municipality) building across it. 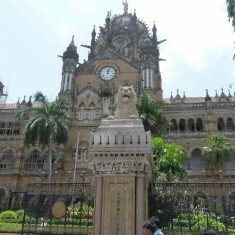 VT station, which was renamed Chatrapati Shivaji Terminus (CST), is one of two UNESCO World Heritage Sites in Mumbai. D.N. Road from Flora Fountain in Fort to VT station is known as Mumbai’s “Heritage Mile”, with classic old buildings lining the road. South Mumbai also has the second largest collection of “Art Deco” buildings in the world. Some of South Mumbai’s most impressive buildings include Gateway of India, Bombay High Court, Mumbai University, Town Hall, St Thomas Cathedral, RBI, Museum, Taj Hotel, area around Horniman Circle, Elphinstone College, David Sassoon Library, NGMA and Western Railway HQ. Please read this article for details on the walking tour of the key attraction of South Mumbai. Marine Drive is a beautiful sea facing promenade on the Arabian Sea. The main attraction of Marine Drive is the stunning view and the pleasure of a walk in the cool sea breeze. 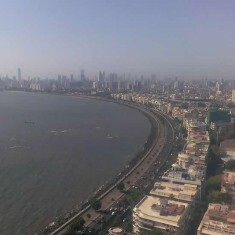 The land from Nariman Point in the South to the Governor’s bungalow in the north is shaped as a necklace, which is why Mumbai’s Marine Drive is also called “Queen’s Necklace”. Marine Drive is home to the second largest gathering of Art Deco Buildings. To the north of Marine Drive is the golden sand beach of Chowpatty. In the center of Marine Drive are a fish aquarium and 5 cricket grounds, where one can catch a game of cricket. Please read these articles for more information on Marine Drive and information on Chowpatty Beach. Sanjay Gandhi National Park is the world’s largest National Park within city limits; it is also among the most visited nature parks in the world. Borivali National Park is one of Mumbai’s favorite picnic spots. 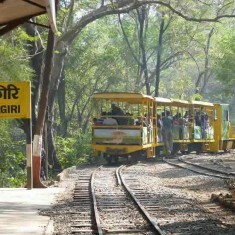 Visitor attractions within Borivali National Park include a lion and tiger safari, boating, a 2.5 Km mini train ride inside the park, Kanheri Caves (which are historical Buddhist caves), nature trails conducted by Bombay Natural History Society (BNHS) and WWF India, trekking and rock climbing. The 104 sq km Borivali National Park is home to many species of mammals, birds, insects, reptiles, trees and plants. Please read this article for more information on Borivali National Park. Elephanta Caves is an UNESCO World Heritage Site. Elephanta Caves are located on Elephanta Island, which is an 11 Km boat ride from Gateway of India. 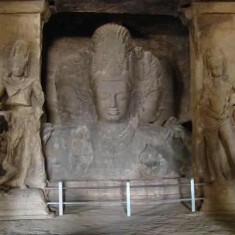 Situated on a hill, Elephanta Caves comprise of 5 Caves with statues of Hindu deities and 2 caves with Buddhist statues. The most impressive statue at Elephanta is the 20 feet “Trimurti”, which is the three heads of Lord Shiva. Elephanta Caves is a pleasant ferry boat ride from Gateway of India. Ferries operated from 9:00 am to 2:30 pm and a return ticket cost Rs 120. Please note that there are NO boats on Mondays and boat service is stopped during the monsoon season, which is usually from the first week of June to mid September. 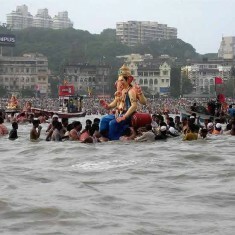 Please read this article for more information on boat from Gateway of India to Elephanta Caves. Mumbai is an island city. Many of Mumbai’s beaches and sea attractions are along its Southern and Western side. Famous beaches in and around Mumbai are Girgaon Chowpatty Beach, Juhu Beach, Dadar Chowpatty, Versova Beach, Gorai Beach, Manori Beach and Madh Island Beaches (which include Marve Beach, Hamla Beach, Aksa Beach, Dana Pani Beach, Erangal Beach, Silver Beach). There are plans to declare the North-East of Mumbai, which consists of Madh Island, Manori, Gorai, Culvem and Uttam Beaches, as a tourism zone. Here in addition to the beaches, tourist can also visit the famous Global Vipassana Pagoda and Essel World Amusement Park. Sadly for a city surrounded by the sea, there are few water sport opportunities in Mumbai. 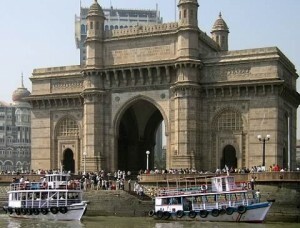 Visitors can enjoys boat rides at Gateway of India, Chowpatty, Versova and Gorai. Please read this article for more info on Mumbai’s Beaches and Sea Related Attractions. Many festivals are celebrated on the streets of Mumbai and they have a community feel to them. Nowhere in the world is the 11 day Ganesh Chaturthi festival celebrated with more aplomb than in Mumbai; these festivities are unique to Mumbai and are a big tourist attraction. Other festivals that are celebrated with gusto are “Janmashtami”, where groups of youngsters form pyramids to break a yogurt pot strung high up; “Bandra Mount Mary Fair”, which is a 9 day celebration of the birth of Mother Mary; “Navratri”, where people dance Garba and play Dandiya Ras for 9 days; Parsi festivals of “Nouroz” (Parsi New Year) and “Petiti” (day of introspection); “Diwali”, when after the Laxmi Puja residents come to open spaces to burst fire crackers. Please read these articles for more information on Ganesh Chaturthi celebrations in Mumbai, Navratri Festival in Mumbai and Mount Mary Bandra Fair. Located in Mumbai’s posh locality of Malabar Hill, these 2 gardens are like any other garden; but their main appeal is that they are located on top of a hill that has a beautiful view of Marine Drive and Chowpatty Beach in the East and Priyadarshani Park and the Arabian Sea in the West. Hanging Garden is constructed on a water reservoir, which supplies water to South Mumbai. There are steps, along a forested area, that lead from these gardens to Babulnath Temple in Gargaum (Chowpatty). 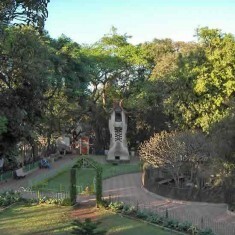 Just north of Kamla Nehru Park and Hanging Garden is a forest that belongs to the Parsi Panchayat. There are three deep wells here where the Parsee community leave their dead. Mumbai’s Global Vipassana Pagoda was built to honour Buddha, spread his teachings, and promote social peace, harmony and tolerance. Relics of the Buddha are enshrined at the pagoda. 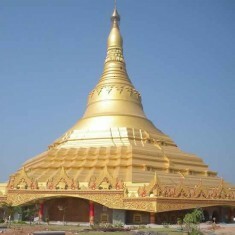 Global Vipassana Pagoda is the biggest pillar-less stone dome in the world. Reaching a height of 325 feet (equivalent of a 30 storey building), 2.5 million tons of stone was used in the construction of this imposing structure. At the centre of the Pagoda is a large meditation hall, which is 280 meter in diameter, and which can accommodate 8,000 people. The Global Vipassana Pagoda is a replica of the world famous “Shwedagon Pagoda” in Yangon (Myanmar). Vipassana meditation classes are held free of charge at the Pagoda. Entry is free for all; foreigners need to have identification (passport, driver’s license, etc) on them. Pagoda timings are from 9:00 am to 7:00 pm, daily. 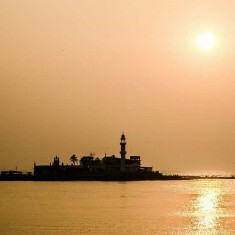 Haji Ali is one of Mumbai’s most famous Mosque and “Dargah” (tomb). The reason it is a major tourist destination is because it is an impressive structure, which is located 450 meters in the sea. Haji Ali can be reached by a pathway, which leads to the mosque. This pathway in the sea adds to the charm of Haji Ali Dargah. When the sea high tide level is very high, Haji Ali Mosque is cut-off from the mainland. Haji Ali Mosque and Dargah are built in the Mughal style of architecture. It is a white structure with domes and minarets. Inside Haji Ali is the tomb (“Dargah”) of the Muslim saint Sayyed Pir Haji Ali Shah Bukhari. The Haji Ali Dargah was built in 1431. This is the largest museum in Mumbai, housing over 50,000 historical artifacts from regimes such as the Indus Valley Civilization, Maurya Dynasty, Mughals, Pahari, Maratha, Guptas, Chalukyas, Rashtrakuta, etc. The three primary sections in the museum are Art, Archeology and Natural History. The museum building is an impressive domed structure built in the Indo-Saracenic style of architecture which is found in many British era buildings in South Mumbai. 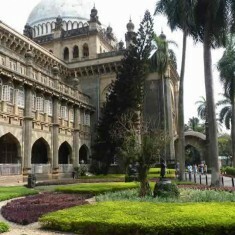 Mumbai s Prince of Wales Museum has been renamed Chhatrapati Shivaji Maharaj Vastu Sangrahalaya (CSMVS). Other popular museums in Mumbai include Dr Bhau Daji Lad Museum at Mumbai Zoo, Mani Bhavan and RBI Monetary Museum at Fort. Please read this article for more information on Mumbai’s Museums. Mani Bhavan was Mahatma Gandhi’s Mumbai based residence and headquarters from 1917 to 1934. Mani Bhavan has been converted into a Museum and Library in honor of Mahatma Gandhi and the Indian Independence movement. Its official name is Mani Bhavan Gandhi Sangrahalaya. Visitors come to Mani Bhavan because of its historical significance and also to feel the presence of a great man. In November 2010, US president Barack Obama and Michelle Obama visited Mani Bhavan. The area around K Dubash Marg (Kala Ghoda), Museum/Regal and Colaba Causeway is the art district of Mumbai. 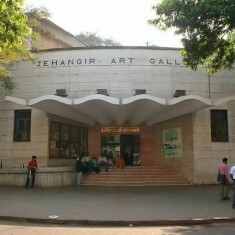 The most famous art galleries in this area are Jehangir Art Gallery, National Gallery of Mordern Art (NGMA), Prince of Wales Museum, Max Mueller, Institute of Contemporary Indian Art, Delhi Art Gallery, Gallery 7, Lakeeren Contemporary Art Gallery, Chatterjee & Lal, Volte, Sakshi Art Gallery, Pundole Art Gallery, Gallery Maskara, Mumbai Art Room and more. 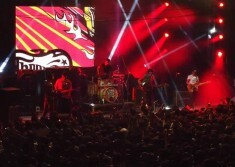 Every year the 9 day Kala Ghoda Arts Festival is held starting from the first Saturday of February. The Kala Ghoda Arts Festival has over 400 events related to the arts, such as theatre, music, dance, literature, movies, etc. Entry to all these events is free and this is the largest free cultural festival in the world. Please read this article for more information on the Kala Ghoda Arts Festival and art galleries in Mumbai. 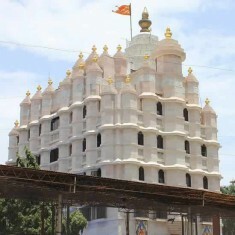 From the viewpoint of faith, the most important Hindu temples in Mumbai are the Mumba Devi Temple near Crawford Market (Mumbai is named after Goddess “Mumba Devi”), SIddhi Vinayak Temple in Prabhadevi, Mahalaxmi Temple near Peddar Road and Haji Ali, Babulnath Temple at Girgaum Chowpatty, Banganga, which is a holy pond at Walkeshwar, Sitaladevi Temple at Mahim, Kanyakaparameshwari Temple at Matunga, Kannikaparemashwari Mandir at Matunga. From an aesthetic point of view, the most beautiful temples are the Babu Amichand Panalal Adishwarji Jain Temple at Malabar Hill, ISKCON temples at Girgaum and Juhu. Please read this article for more information on famous Hindu Temples in Mumbai. 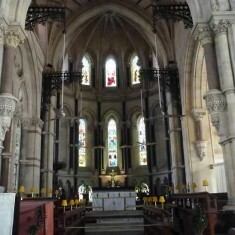 Mumbai has some exquisite churches, most of which were built during the British era. Architecturally the best churches in Mumbai are St. Thomas’s Cathedral at Fort, Cathedral of Holy Name at Colaba (near Regal), RC Church near Navy Nagar, Gloria Church at Byculla, and Mount Mary Basilica at Hill Road in Bandra West. Many churches in Mumbai are frequented by people of all faiths; for instance Father Agnel Church in Bandra gets many Gujrati devotees and St. Michael’s Church at Mahim gets many Maharastrian worshippers.